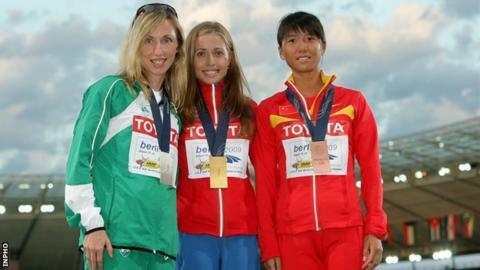 Former Irish race walker Olive Loughnane could be set for a retrospective world championship gold. Olga Kaniskina, who pipped Loughnane for the world 20 kilometre gold in Berlin in 2009, is among five Russian walkers handed backdated doping bans. Kaniskina could be stripped of her 2009 and 2011 world titles. Those banned include 2012 Olympic 50K winner Sergei Kirdyapkin though reports suggest he will keep that gold, when Ireland's Robert Heffernan was fourth. Last month, 2013 world 50K champion Heffernan was retrospectively presented with a European bronze medal from 2010 after Russia's Stanislav Emelyanov was belatedly stripped of the title. In the case of Kirdyapkin, his ban is written to allow his results from 12 June 2012 to 14 October 2012 to stand, in between periods in which his other results have been annulled. And as it stands, Kirdyapkin will be eligible to defend his Olympic title in Rio. Cork-born Loughnane, 38, retired from competition in early 2013 and her 2009 world silver was the highlight of a walking career which four Olympic Games appearances. Bans of three years and two months were handed by the Russian Anti-Doping Agency to Kirdyapkin, Kaniskina and 2011 world champion Sergei Bakulin with all three cases backdated to late 2012. Valery Borchin, an Olympic gold medallist in 2008, was banned for eight years from October 2008 for a second doping offense, while Vladimir Kanaykin was banned for life for a repeat offence. Tuesday's reports from Russia suggested that the bans do not affect any Olympic medals although five world championship gold medals and a silver medal from 2009 and 2011 may be re-awarded. All five athletes' bans are based on the findings from their biological passports, which track blood values over long periods. The five athletes had all been suspended since late 2012 but this had not been made public by the IAAF until this week. The Russian Anti-Doping Agency general director Ramil Khabriev said the delay was because the IAAF passed the cases to the Russian athletics federation, who lacked the resources to deal with "the specificity of biological passport cases". The Russian athletics federation and the national anti-doping agency both faced accusations of misconduct in a documentary broadcast last month by German TV channel ARD. The federation was accused of operating a systematic doping program, while agency employees were accused of covering up positive tests by leading athletes.